In a large bowl, cream together butter and sugar until pale and fluffy, about 2 minutes. Add egg, egg yolk, and vanilla; mix until smooth. In a medium bowl, combine flour and salt. Add flour mixture to butter mixture in two additions, mixing until just combined after each addition. Split dough in half. Roll half the dough into a 14" x 9" rectangle. Spread half the Nutella over the cookie dough. Sprinkle with half the nuts. Roll the dough up, starting with the long side, to create a cookie log. Repeat with remaining dough. Wrap cookie dough log in plastic wrap and refrigerate for at least 1 hour. Preheat oven to 350 degrees F. Line a baking sheet with Sil-Pat or parchment paper. Remove cookie dough log from fridge. 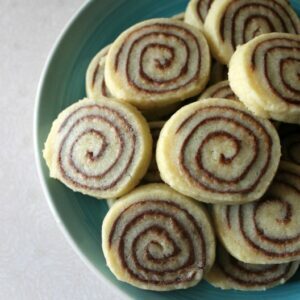 Cut off excess dough at edge, and then slice into 1/4" slices. Place slices on prepared baking sheets. Bake for 8 to 10 minutes, or until edges just begin to brown. Remove from oven. Cool on baking sheet for 1 minute, then transfer to wire rack to cool completely.